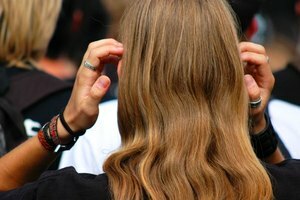 Natural elements and product build-up can form as toxins in your hair, leaving your hair heavy and greasy feeling. 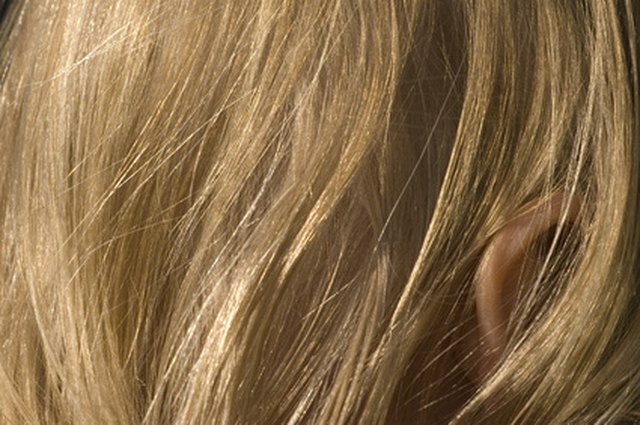 These toxins usually cause your hair to tangle easily, which then leads to split ends and hair breakage. Solve the problem by using baking soda and apple cider vinegar, which removes the toxins in your hair, making it healthy, smooth and shiny. Baking soda will dissolve the product build-up and will deep clean the hair shaft. The vinegar's strong astringent properties seal the cuticle and help remove product residue. The concoction is cost-efficient, and the ingredients are readily available in your kitchen. Mix baking soda with water. Sprinkle baking soda in your hand, filling about a quarter of your palm, and then add enough water to create a thick paste. Apply this onto your scalp using a circular motion. Create another baking soda mixture. Mix an ample amount of baking soda and water in your palm to create a thick paste. Massage this onto the rest of your hair. Leave the baking soda mixture in your hair for three minutes. Rinse with lukewarm water. Rinse your hair with cold water. This removes the vinegar mixture, and it seals the cuticle in your scalp. Do this process every week to regularly remove the built-up toxins from your hair. 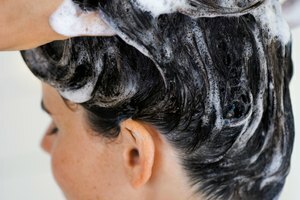 This method of cleansing your hair can be messy, so do this in the shower.